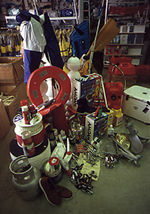 Boating's leading accessory supermarket for power and sail marine equipment. Visit our conveniently located Fannie Bay store and choose from the thousands of lines of the best marine equipment to suit any boat. Our product pricing structure is based on lower than recommended retail prices to guarantee that our customers buy at the best price from the widest range of quality brands including BLA, Ronstan, Harken, Raymarine, Simrad, B&G, Burke and many more. Our workshop manufactures rigging, balustrading and stainless steel cables. Splicing is carried out by an experienced rigger. You can find us at . . .